In 2010, Sami said goodbye to his father. He was going to Britain, his second home, with the hope of coming back to the Jasmine City in the summer of 2011. But he was disappointed. The old Syria was replaced by the winds of the Arab Spring and, day by day, things began to escalate. Blood started to be shed without control, groans of pain and fear increased, and civilians were very shocked. The only solution open to them was escaping over the borders. Not only the people inside Syria faced fear, but also those who had emigrated. Sami was one of thousands seeking a way to save their families by helping them travel to another Arabic country, like Egypt. It was the moment of departure. 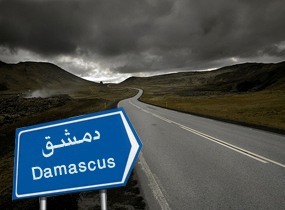 But then his father insisted on staying in Damascus. The car set off from Damascus to Beirut Airport, where the tickets and departure were. Between the two countries’ borders, everyone hid their tears, asking themselves if they would come back to Syria one day or not. Due to his father’s absence, Sami’s joy was incomplete when the family arrived at Cairo. He longed to see his sixty-year-old father and thought it was his duty to try to convince him to follow them to Cairo. Again he resumed his phone calls. He felt scared and sad because of the way tanks’ and guns’ voices were extending all over the country, taking its spirits, whether they were children, women or elderly people. He wondered about his father’s refusal. Was it to protect the properties from being robbed and looted? Or because of his fear of an unknown future as a refugee? Or for another reason? His father loved his country. Departing from it was like separating the soul from the body, like a sudden death. He had opened a private school for young children thirteen years ago. He insisted on keeping the school open, even if the war reached to it, in order to keep the teachers earning their living, and for the continuity of learning. The father preferred to sleep alone in his grandparents’ country house than be a guest in another Arabic country. He preferred living in sorrow and pain than a happy life as an alien. Finally, Sami realised his father’s decision was fate. And that he could not do anything, but pray for him to stay healthy, and for the country to become safe and secure.